There’s probably only one reason why I don’t like doing Gel nails. They’re hard to take off and until today, I though you’d always have to pay someone to take them off. 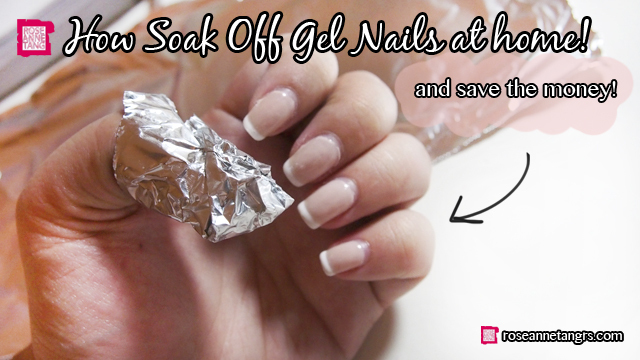 Gel nail polish isn’t like ordinary nail polish. It usually lasts a month, uses UV light to set and regular nail polish won’t be able to get rid of it (when you want to of course). In Singapore, this whole thing sets you back 20 – 25 dollars and that already is more than half a regular manicure – and that’s just removing the gel nail polish! I got my gel nails done because I was doing them in Indonesia and a week later I had to host a video for a client where it was uber important to have good lookin’ nails. I thought why not save a few dollars and do them cheaper and make them last longer so I don’t have to do them again in Singapore. Regularly though, I never opt for this option. I like changing the color of my nails regularly so I don’t need gel manicures. Unfortunately, I was about to go to the salon and pay them extra to take these off…until…I figured out how to do the soak off myself! If you wanna same some moohlah for a meal, then stay tuned! By the way, I’d like to inform everyone that my fingers aren’t very pretty, haha. You could liken them to a wealthy plump lady’s fingers grabbing a cupcake and loaded with huge diamond rings. Or maybe large lady finger biscuits. Whatever you wanna call them really. :p Also the process of “soak-off” is originally not an aesthetically pleasing process, even at the salon. I’m just bringing what they do at the salon..home! First, you’re going to have to file your nails! 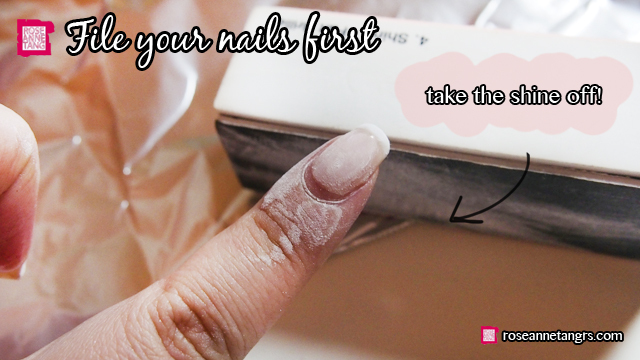 Use a regular nail file and buff your nail to get rid of the shiny top coat. 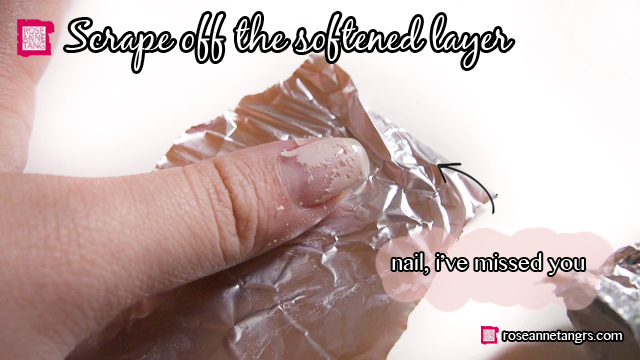 This allows the acetone to penetrate the rest of the nail polish – kinda like removing the protective layer. Don’t worry, you’re actually only touching the nail polish layer and not your actual nails so you aren’t harming them. You’re also going to need aluminium foil for this, cotton rounds and a good nail polish remover. Your nail polish remover must have acetone in the ingredients – usually what nail polish is made of anyway. 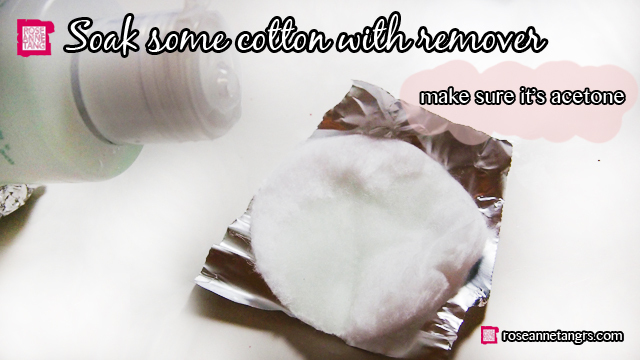 Take some cotton and soak it with the nail polish remover. Placing it on the tin foil like I did so above makes things a lot easier and catches any drip. 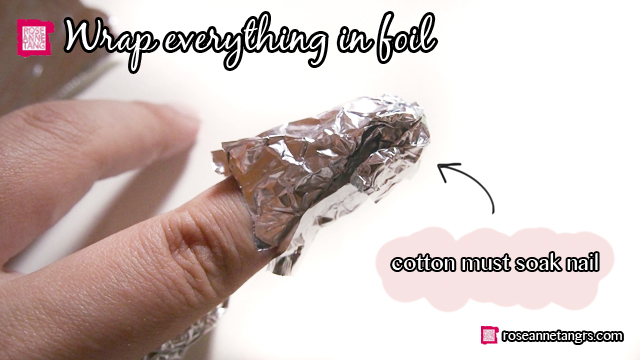 Then just like the salon, place the soaked cotton on top of your finger and wrap the whole thing in the tin foil. The foil holds everything together and presses the cotton onto the finger. Now it’s time to wait about 15 – 20 minutes for the gel layer to soften. Now you need to scrape off the gel layer. This is the least fun part. At the salon, they usually use a cuticle pusher for this and if you have one, that’s great. I didn’t have one so I used my fingernail instead. I know it sounds gross but it works. You just scrape it off. If you leave it in the acetone for longer, it’s easier to come off, but if you feel it’s a little powdery, you should wrap it up again and wait a while longer. Ta-Da! Your nail is done! Actually, the hardest part is if you have long nails like I do and taking the gel layer off the nail that’s not attached..to your finger..is the hardest part. When you finish scraping everything off, it feels a bit rough. 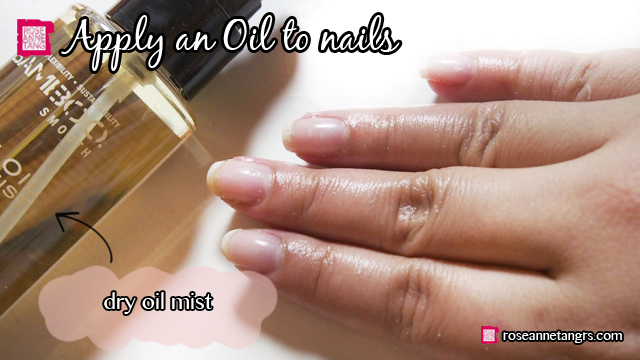 Now it’s time to take some oil and apply it to your nails. Obviously cuticle oil would work best for this but I didn’t have any either so I thought any oil would really work. I took my dry hair oil mist and sprayed my fingers and rubbed them in a bit. Then I took a buff (slightly lower roughness grade than an ordinary filer that you would have used for step 1) and buffed it out. 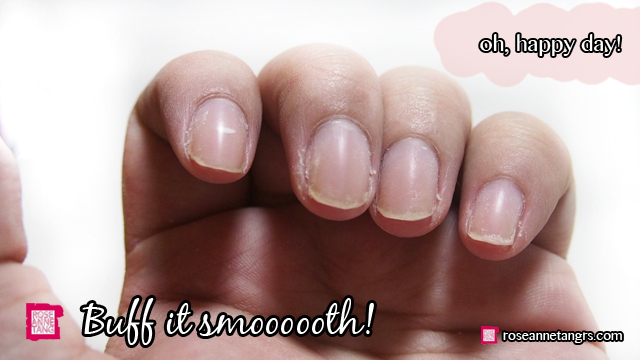 The result is smooth nails that were back to the original and any trace that you had gel nails is gone! Woot woot. So happy to take them off, you have no idea. I just love changing my nail color so sticking to one makes me really tired. 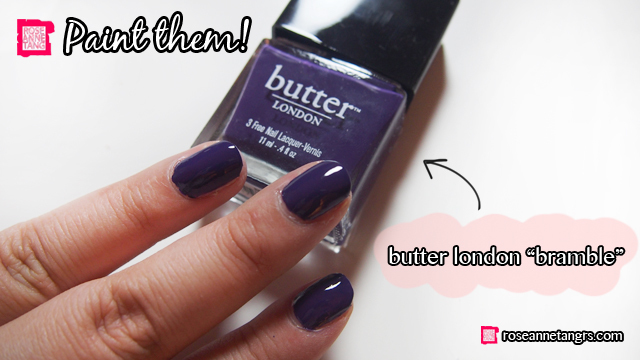 I painted them with Butter London’s brand new color – bramble! It’s a beautiful eggplant purple! This is just one coat as well and I’m super impressed with the pigmentation and finish! I also topped it with a seche vite top coat! 🙂 Hope you found this post useful and hope it helped saved that extra meal with you friends or family. You don’t need to pay someone to remove your nail polish for you! 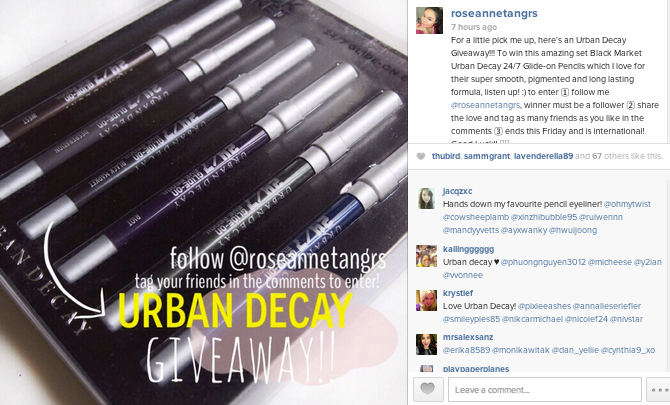 By the way I’m also having an Urban Decay Black Market 24/7 Glide on Pencil Set Giveaway on my Instagram @roseannetangrs! Find my profile on Instagram on your phone to see how you can enter! My Idiot Proof Guide to RED Lips & Lipsticks! Thank you so much. I am 48, South African living in Vienna, Austria, workmat United Nations. Really enjoy your thorough, mature yet fun way of sharing. You have a beautiful natural voice. Thank you. This is such a useful post! Would save me tons of money!! 🙂 I haven’t had much luck finding nail polish remover with acetone though! Do you know where I can get them? Thank you! If you just get a regular nail polish and look at the back at the ingredients, as long as it says acetone, should be fine 🙂 most nail polishes are!